We were on 280 north approaching Ocean Ave. when I remembered a show that I had seen on The Food Network. Guy Fieri (Diners Drive-ins and Dives) stopped in at “Joe’s Cable Car Restaurant“. Ten minutes later we were ordering burgers from our waitress, Savannah. Our freshly ground steak beef burgers were just as good as Guy had described them on TV, but my husband thought that they were overpriced for the quantity. Besides the great people-watching, as this is the common corridor from Bart to all MUNI points beyond, I ran into an old friend here, walking to the gym, and I got to ply her with beer and conversation. 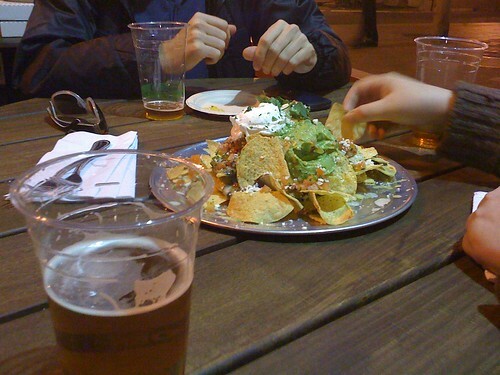 Isn’t that a fantasy we all have- that on the way to the gym our friends will pull us into a cafe and make us drink beer and eat nachos? New 2-star to Coi (kwa) in North Beach. *Why* is North Beach Restaurant in there? Kind of mysterious about some other restaurants that were left out. Chez TJ’s went down 1 star, but understandably as a chef moved on. 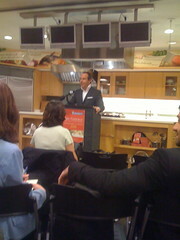 The media event was nice, the tablehopper didn’t table-hop, which was kind of funny. I loved meeting Paolo of Eater SF, who’ve I’ve enjoyed reading for quite a while. There was a waiter who was a dead ringer for John Edwards. For such a foodie town it was a lot sparser than Tokyo or New York parties of the same purpose. We have less media? We don’t care as much? I have no idea. Note: I’m guest blogging for their contest, which has some neat prizes and I’ll post all the info here. Posted more thoughts on the guide on my blog: banane.com. Michelin folks were very nice and appeased my concerns about French reviewers- they’re all American in our cities- and ethnic cuisines, etc. They’re going digital with a mobile app called ubiubi.mobi. One question from the audience: “how are you responding or reacting to Yelp, will you add comments in your guide, or guest reactions?” Led to a rambly answer by Jean-Luc about the history of the guide, and how he predicts people will still be using paper to read from in 10 years time. I think a better answer (I know it’s weird to answer for him) would be that there are *so many problems with Yelp* that they don’t compete, but complement each other. For a well-chosen, selective guide with good iconography and a respected reputation, it’s a relief for the 400 reviews for 1 restaurant on Yelp that are actually dialogues of teenieboppers flirting with each other. Disagree? Comment! Note: make sure to have a hangover and/or huge appetite before heading out. Breakfast/brunch at Cafe Divine (Union & Stockton)- get seated at the sidewalk tables, and, with mimosa in hand, watch people in the park. I’d recommend the fruit bowl w/ granola or the poached eggs. Divine doesn’t have a huge menu but the ingredients are top notch. OR hit La Boulange (Columbus, Green) for a pastry and a bowl of cafe au lait. Describe how the park used to be the common for the neighborhood- the patch of ground where you could garden or keep livestock. Mention the falsehood that DiMaggio married Marilyn Monroe at the church- actually just photographed in front of it. 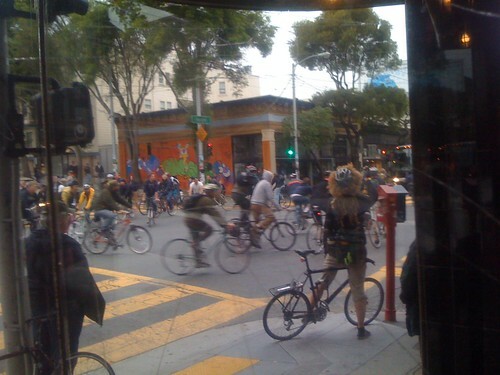 Went to dinner at (the new, remodeled) Magnolia at 7:30PM and narrowly missed the traffic jam following Critical Mass- this is the corner of Masonic & Haight. Personal vow here to bike in the Mass next month! * Medjool on Mission. Huge roof deck with capacity for crowds. Tiny little elevator, but that’s the only real drawback. * Personal favorite: Fish! in Sausalito, lots of deck and locally fished seafood. 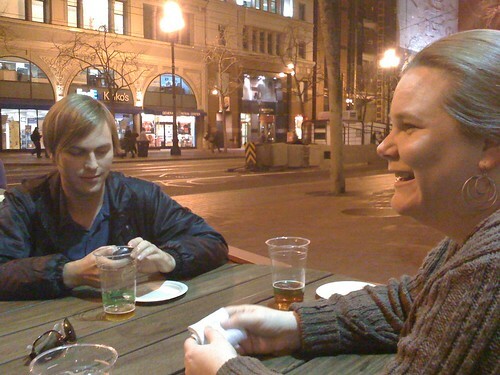 * Most North Beach places have outside sidewalk seating. 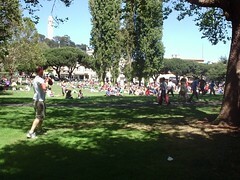 * Metro Hotel on Divisadero near Haight has a beautiful back garden. Please comment with your favorites!